SignworldAmerica.com carries a full range of white and colored LED light modules and power supplies to help your clients reap the benefits of LED technology and light up their lightboxes, trade show display booths, windows, backlit signs or channel letter signage in vivid color. 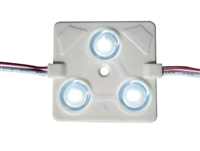 LED lights come in pure white, yellow, green, red and blue. We carry 35-watt, 60w, 100w, 150w and 350w LED module power supplies. Same day shipping is offered on LED Module and Power Supply orders placed with us before 1pm PST (4pm EST).